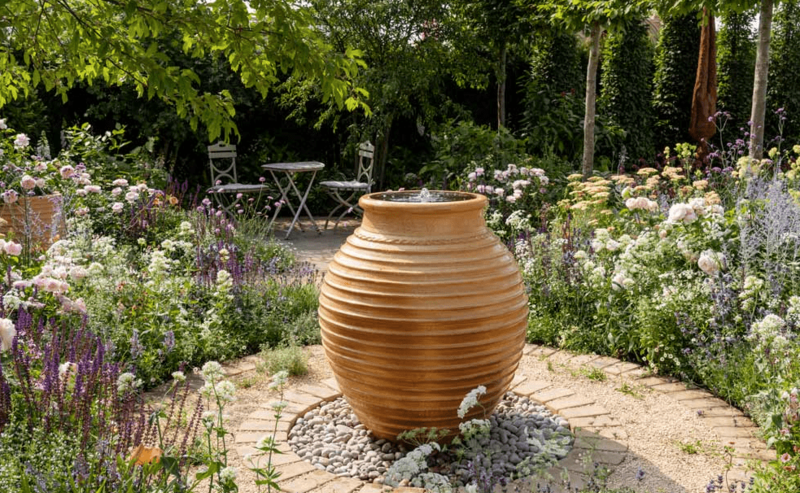 The BALI Go Landscape initiative teamed up with designer Rosemary Coldstream to bring together a garden of two halves, giving students the opportunity to work on an RHS Hampton Court show garden, and it ended in gold. Created for an imaginary couple who share a love of gardening but have differing design tastes, one side displays a traditional country garden style in a palette of blues, purple and pinks, while the other is distinctly contemporary with a fusion of green foliage and splashes of bold colour. A row of pleached Hornbeams (Carpinus betulus) forms a clever dividing line between the two plots creating a ‘hedge on stilts’ that unifies the space. The garden is sponsored by BALI (British Association of Landscape Industries) as part of their GoLandscape programme – an education, skills and careers initiative, designed to inform and inspire new recruits and combat industry issues, including a severe skills shortage. Rosemary said: “I am absolutely thrilled this garden was awarded a Gold Medal for my first ever show garden and delighted to be able to share it with everyone involved in it’s creation. The whole process has been a wonderful experience from the moment BALI asked me to be involved, to the final few weeks, working on the ground to bring the garden to life. The garden was created by landscaping apprentices, trainees and students who are part of BALI’S GoLandscape initiative, supported by the RHS. The students, from several UK colleges including Capel Manor and Writtle College, were mentored by leading industry contractor Mark Britton of The Outdoor Room and Jake Catling of The Landscaping Consultants. BALI chief executive Wayne Grills commented: “Since GoLandscape launched nationally earlier this year, following a successful pilot phase, BALI has witnessed tremendous amounts of support for its careers initiative, designed first and foremost to promote landscaping as a viable and rewarding career option for students choosing their future career path, to support students and apprentices already studying horticulture courses from entry level through to degree level to find employment within the industry, and, to combat the current skills gap crisis that our industry is currently facing. “By working with industry partners, including the RHS, BALI and its GoLandscape Ambassadors we are working tirelessly to help promote and showcase the skills and talents of our students and apprentices, including the garden that is on show this week at RHS Hampton Court Palace Flower Show with BALI GoLandscape’s Best of Both Worlds, to really help get the message across that high quality landscaping is essential for improving our environment, health & wellbeing and providing a sustainable future for all.